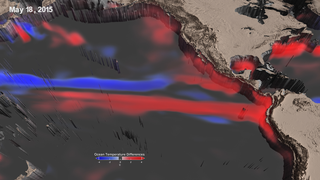 Follow changes in sea surface temperature and ocean currents during El Niño. 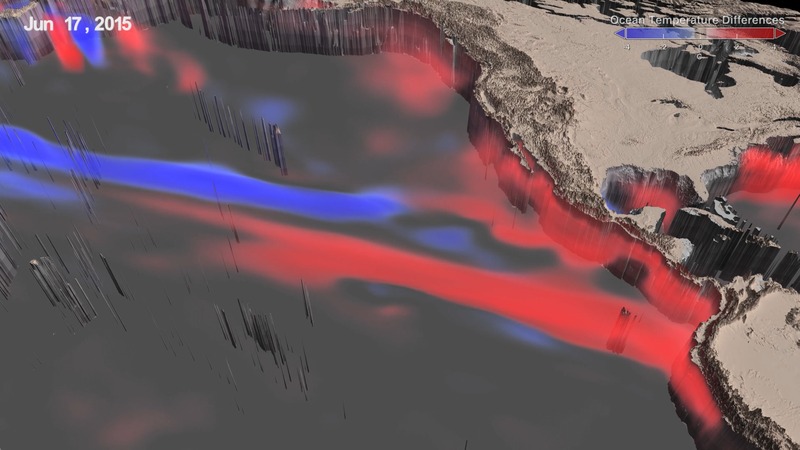 El Niño is a recurring climate pattern that causes dramatic weather changes on both land and sea. These changes start in the equatorial Pacific ocean with warmer than usual ocean temperatures. In non-El Niño years, equatorial trade winds blow west over the Pacific Ocean and normally carry warm water toward Asia, drawing cooler water up from the deep along South America. But during an El Niño, these winds weaken and occasionally reverse direction. The warm Asia instead remains in the eastern Pacific. The most recent El Niño occurred in 2015-2016. The majority of ocean warming occurred between July 2015 and January 2016. The warming event ended only when cooler waters traveling west just north of the equator, reflected off of Asia and headed back toward the Americas. 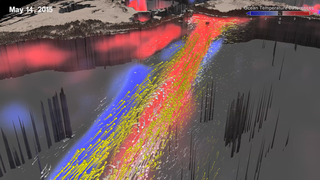 NASA Goddard's Global Modeling and Assimilation Office (GMAO) combined satellite observations with model data to recreate what happened in 3D. 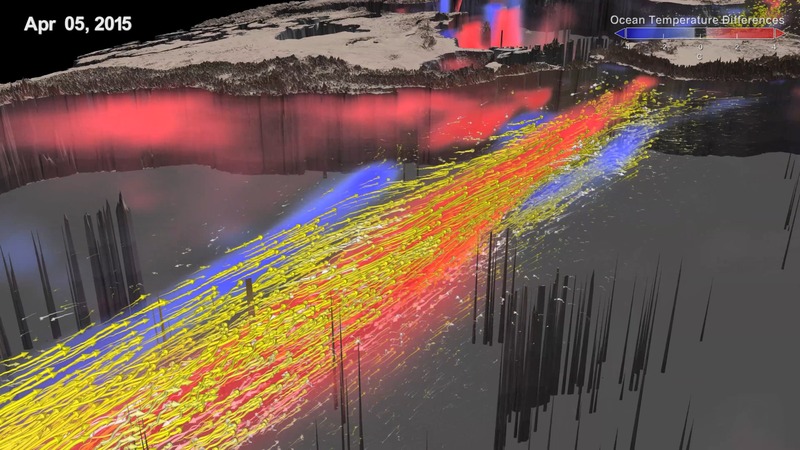 Focused on the top 800 feet (225 meters) of the ocean’s surface, yellow arrows illustrate eastward currents and white arrows are westward currents. The resulting westerlies – winds out of the west – cause eastward currents to pulse. The most intense effects of the 2015-2016 El Niño were seen in the distribution and intensity of precipitation in California and along the East Coast through the winter months. Watch the video to learn more. 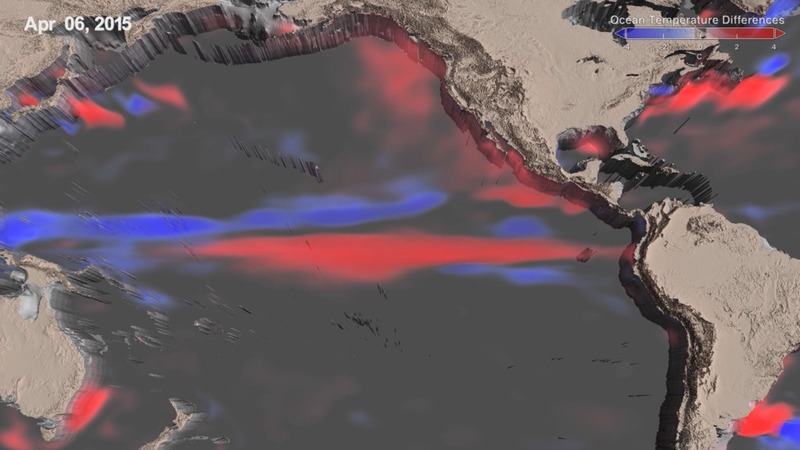 Watch El Niño affect sea surface temperature and ocean currents. Blue and red represent different temperatures than normal. A warmer than normal equatorial Pacific Ocean is shown here in red. Yellow arrows show strong eastward currents, pushing warm waters toward the Americas. 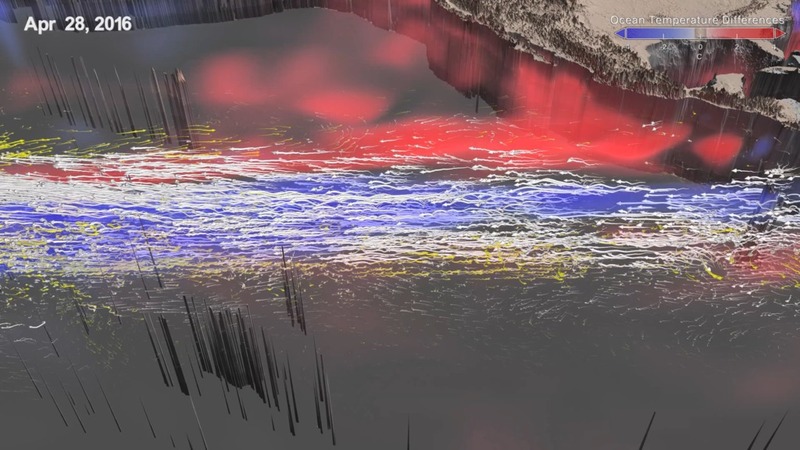 White arrows show west-flowing currents, which return as El Niño fades away and conditions return to normal.